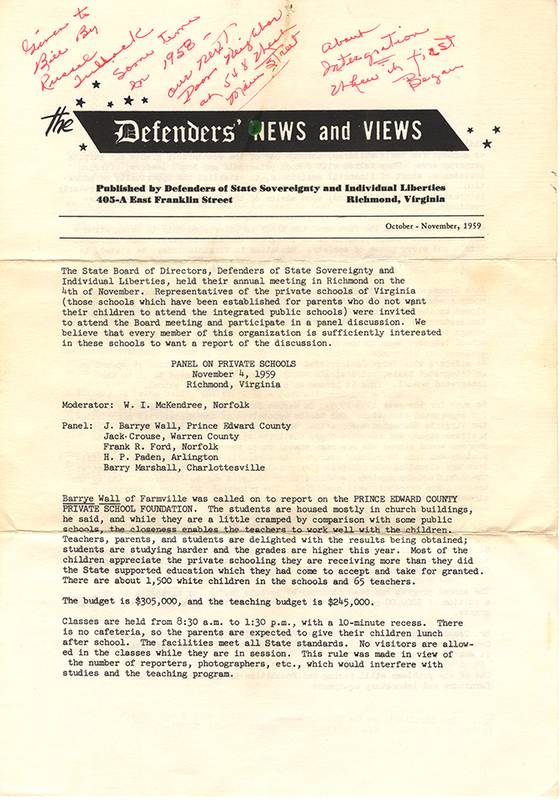 Publication of The Defenders of State Sovereignty and Individual Liberties, a grassroots political organization dedicated to preserving strict racial segregation in Virginia's public schools. 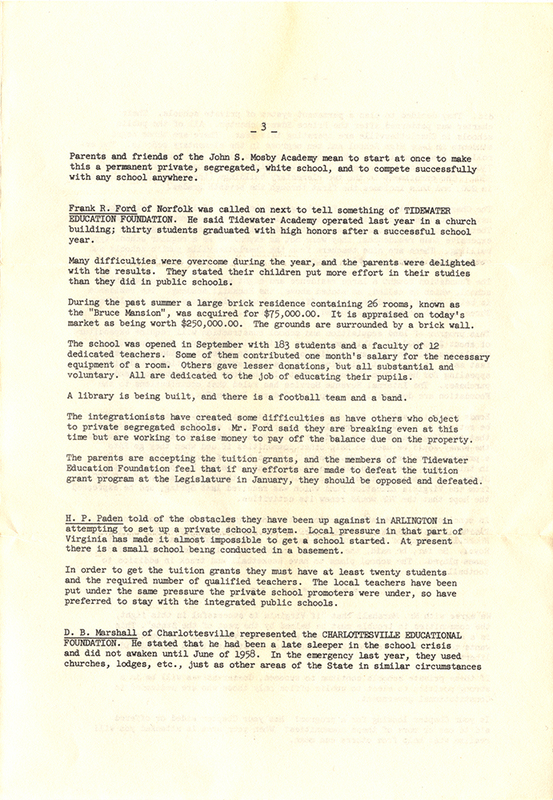 The group was established in Petersburg in October 1954 following the Supreme Court decision Brown v. Board of Education of Topeka, Kansas. Chapters of the group opened across the Commonwealth of Virginia. This newsletter is a folded sheet, two pages printed on both sides. The text header on the front page says, "The Defenders News and Views/Published by Defenders of State Sovereignty and Individual Liberties/405-A East Franklin Street." 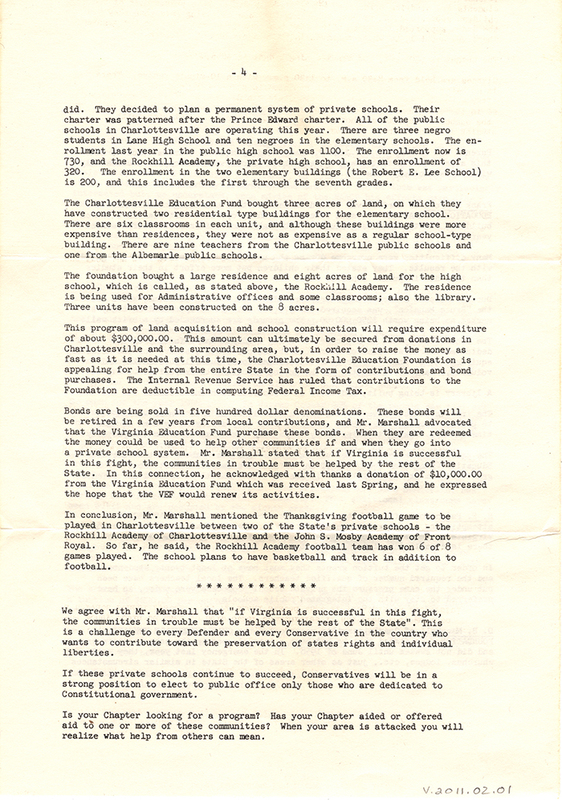 This document reports on the annual meeting of the Defenders that was held on November 4, 1959 in Richmond, Va. During this meeting a panel of representatives from private schools (identified as "those schools which have been established for parents who do not want their children to attend the integrated public schools") spoke. 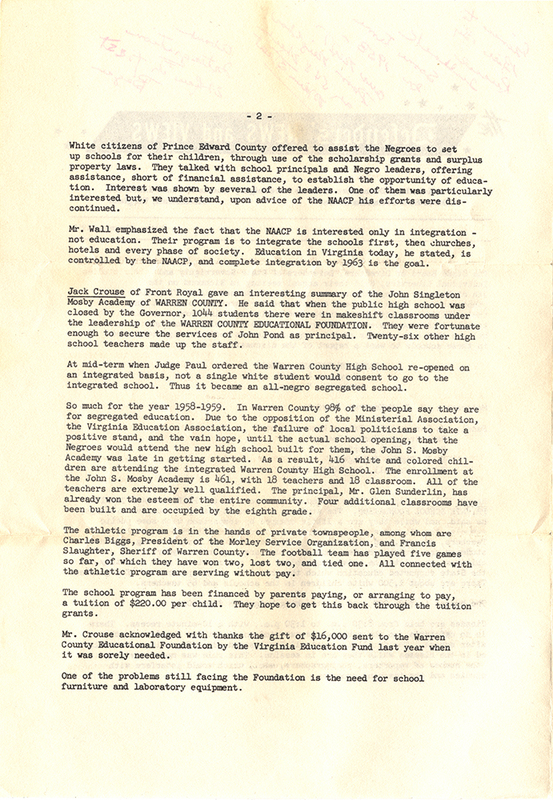 "White citizens of Prince Edward County offered to assist the Negroes to set up schools for their children, through use of the scholarship grants and surplus property laws....Mr. Wall emphasized the fact that the NAACP is interested only in integration - not education. Their program is to integrate the schools first, then churches, hotels and every phase of society. Education in Virginia today, he stated, is controlled by the NAACP, and complete integration by 1963 is the goal." Defenders of State Sovereignty and Individual Liberties, “The Defenders News and Views [Newsletter],” Social Welfare History Image Portal, accessed April 26, 2019, https://images.socialwelfare.library.vcu.edu/items/show/285.